When we first began watching turtles in 1989, we observed that goldring surgeons (Ctenochaetus strigosus), saddleback wrasses (Thalassoma duperry), and whitespotted tobies (Canthigaster jactator) were the cleaners. By 1991, we began seeing eight-lined wrasses (Pseudocheilinus octoaenia) and millet seed butterfly fish (Chaetodon miliaris) participating in cleaning. This summer (1995), for the first time we saw long-nosed butterflies (Forcipiger flavissimus) engaged in cleaning activity. Unlike the other cleaner species, which we noticed at work no matter where the turtles were resting, we saw this change in the long-nosed butterflies at only one specific place: The Rock. About half a dozen of these fish concentrated almost exclusively on tumors whenever the opportunity arose. 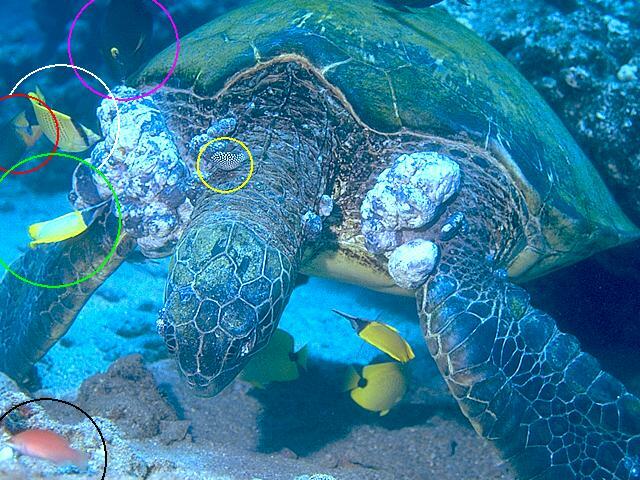 They clearly preferred tumors over their usual foraging among the corals. This picture is interesting because of the number of cleaner species that can be seen in it. All six of the most common cleaners are present, each circled in a different colour. Note that you have to load the JPEG version to get the best view.